This Office Star Products bookcase has eye-catching design and durable features. Its open storage design lends to easy access and displaying of all your favourite books, knick-knacks, and photographs. Designed for lasting durability, this Office Star Products standard bookcase comes with a sturdy structure that will keep your items well organized. Pro-Linea has all the elements to create a modern and refined work environment. The clean lines of this collection bring a fresh look without compromising functionality and durability. This bookcase offers metal legs and two shelves, one of which is adjustable. This unit meets or exceeds ANSI/BIFMA performance standards. Finished back. Jay Bookcase 2.0 is the perfect blend of quality craftsmanship and functionality, including beautiful detailing and careful design. Featuring four open airy shelves made from beautiful solid pine wood, and available in a variety of colors, this unit will add style and interest to any decor. Display travel trinkets, favorite books, family photos, and collectibles to create an accent sure to be the focal point of any space. Available in blue wash, yellow wash, red wash, green wash, grey wash, nature, and black wash finishes. The Joy Bookcase blends practicality and functionality without compromising on style or design. Perfect for the living room or office, the piece includes two squared off cubbies, one in white and the other in a bright bold hue, adding a pop of color to your space. Featuring five open shelves, this freestanding piece is great for storing books, displaying framed photos, travel trinkets, and favorite design items. A smaller piece with purpose, the bookcase creates a stylish statement, while staying functional. 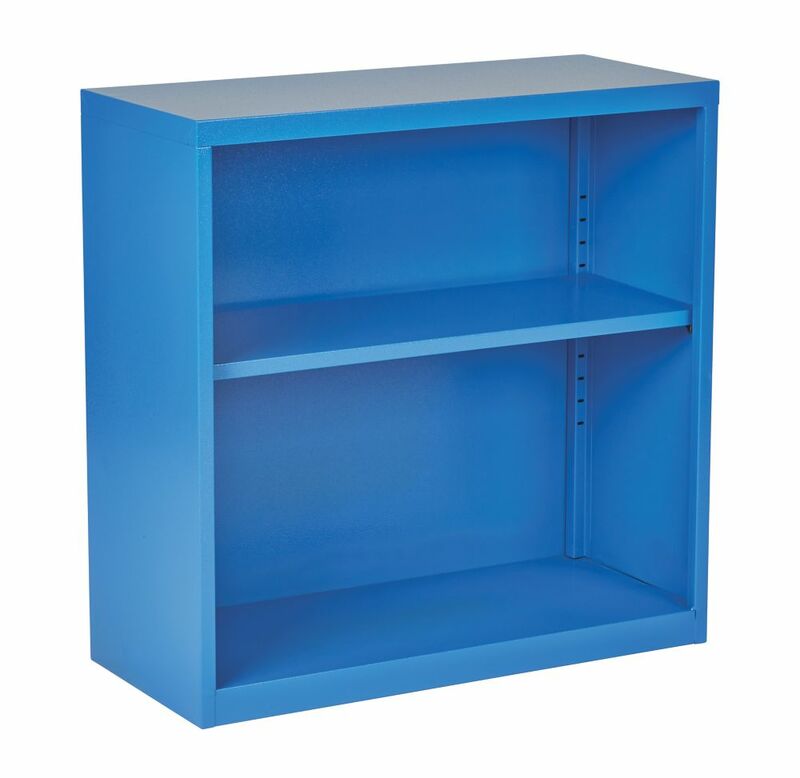 28-inch x 28-inch x 12-inch Metal Bookcase in Blue This Office Star Products bookcase has eye-catching design and durable features. Its open storage design lends to easy access and displaying of all your favourite books, knick-knacks, and photographs. Designed for lasting durability, this Office Star Products standard bookcase comes with a sturdy structure that will keep your items well organized.